System.out.println("char to String using String.valueOf() : " + bStr); // "b"
This is the third example to convert a char primitive value to a String object in Java. In this example, we have used Character.toString() method. Remark: This method returns a String object representing the given char. It returns a String of length one consisting solely of the specified char. Internally it also calls String.valueOf(char c) method. 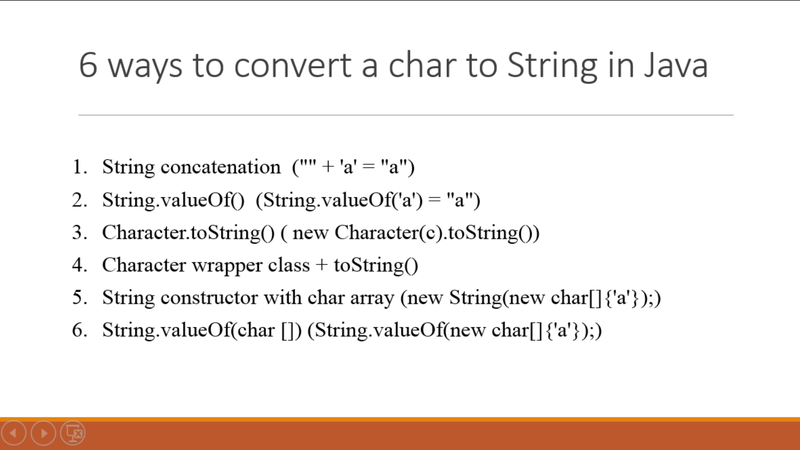 This is the 4th example of converting a char value to String object in Java. This time, we will use java.lang.Character class, which is a wrapper for char primitive type. Remark: This method returns the String equivalent of Character object's value of length 1. Internally this method wraps the encapsulated char value into a char array and passed to String.valueOf(char) method. Remark: This is the method which is internally called by String.valueOf() method for char to String conversion. This constructor allocates a new String object to represent a sequence of characters passed via char array argument. The contents of the character array are defensively copied so that subsequent modification of the character array doesn't affect the newly created String. Remark: String.valueOf() is overloaded to accept both char and char. Since the valueOf() method which accept a char, internally wrap that char into a character array it make sense to use this overloaded method to directly pass a char array, which in turn passed to String constructor which accepts a character array. That's all about how to convert a char value to String in Java. You can choose any of the above methods, which suits your test but remember, String concatenation is not efficient and can waste a lot of memories if used in the loop. String.valueOf() is more readable and efficient, so should be your default choice. All of the above methods internally uses new String(char) though.